Nat Smithson is a singer/songwriter/pianist who began her musical journey shortly after leaving high school when she purchased her own equipment, learnt a bunch of tunes and started performing cover shows across Adelaide. 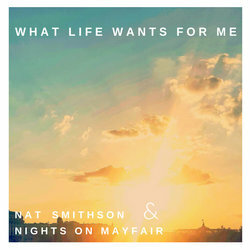 Influenced in her earlier years by artists including Kimbra, Emeli Sande and Adele, Nat infused her own style into a variety of pop, soul and rnb tunes. Nights on Mayfair are made up of a solid rhythm section with bass guitarist Scott being an Aria nominated artist and producer, co-writer and musician, and drummer/percussionist Jed Thomas having years of live performance and song writing experience from his time as part of renowned original and cover bands Stonyfell and The Happy Leonards. Scott has also played and recorded on records including ‘Drinking From The Sun – Hilltop Hoods’ album, four ‘Lowrider’ albums, toured in support acts for the likes of Christina Aguilera, Alicia Keys, Lionel Richie and countless national and international shows. Having produced and recorded with a range of artists, Scott wanted to continue to create a platform to write and play the type of music he loves and found the inspiration he needed working with Nat and Jed. What Life Wants For Me is a modern pop-soul gem. It takes the classicism of Motown in all of it's upbeat charm and casts rays of optimism from the depths of it's soul.